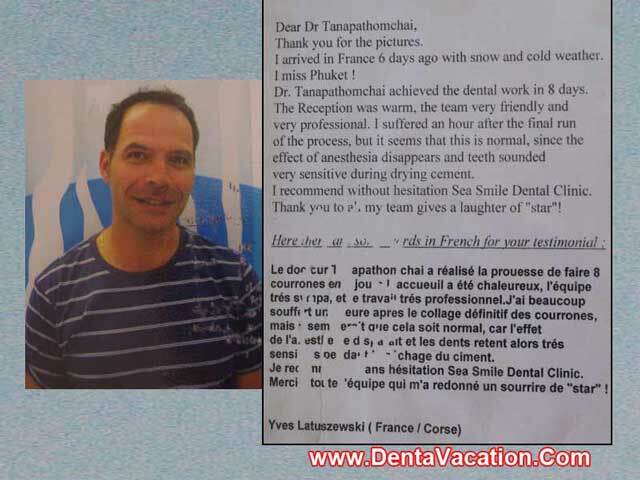 Ywes Latuszweski, a French national from Corse, had eight dental crowns at one of the leading dental clinics we work with in Patong beach area of Phuket – Thailand. “Dear Dr…Thank you for the pictures.I arrived in France 6 days ago with snow and cold weather. I miss Phuket! Doctor achieved the dental work in 8 days. The reception was warm, the team very friendly and very professional. I suffered an hour after the final run of the process, but it seems that this is normal, since the effect of anesthesia disappears and teeth sounded very sensitive during drying cement. I recommend without hesitation … Dental Clinic. Thank you to all my team gives a laughter of “star”! The Patong clinic where the French national got his dental crowns is the final stop for many dental tourists. The clinic, with ISO 9001:2008 certification for both itself and its on-location lab, receives hundreds of patients from Australia, New Zealand, the United Kingdom, the United States, France, Norway and many other countries each year. Take a look at another such Phuket dental crown testimonial in which Brendan Christensen from Australia talks about his experience at the clinic.